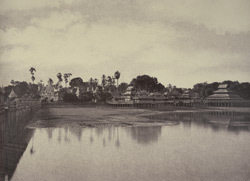 Photograph by Linnaeus Tripe, from a portfolio of 120 prints, showing a view of the wooden bridge (U Bein Bridge) at Amarapura in Burma (Myanmar). In 1855 an officer from the Madras Infantry, Linneaus Tripe, was attached as official photographer to the diplomatic mission sent from India to the Burmese capital of Amarapura. The mission's goal was two-fold: to negotiate with King Mindon Min his acceptance of British rule over Pegu, and to gather information about the country in every detail. During the journey up the Irrawaddy (Ayeyarwady) from Rangoon to Amarapura, Tripe produced a portfolio of 120 large views of scenery and architecture which are amongst the earliest – and finest - surviving images of this then little-known kingdom. A few years after they were taken, the royal capital was transferred 11 km upriver to Mandalay. While the teak bridge on the left of this photograph still exists, few old buildings in the abandoned capital survive and Tripe’s photographs remain the only accurate visual record of the old royal capital.